Fairy tales. They are not to be read or listened to lightly, for they are essential to the young child’s well-being. In a Waldorf kindergarten, there a steeping in these tales, with the same story told again and again, every day for a week. You need only watch the children’s faces as they sit raptly listening, to know how deeply these stories are taken in. As a Waldorf teacher in the lower grades, I was always amazed at how accurately the story that was told the day before was recounted by the children. No detail was missed, indicating how very enmeshed in the tale they were. Stories are also the perfect medium for learning, as they carry otherwise abstract concepts within a vessel of beauty and grace. The letters are taught, one by one, when the child is ready to learn them, usually at 6 or 7. Each letter is lovingly cloaked in a story, so the letter “B” for instance might be introduced with the Grimm’s fairy tale, “The Queen Bee.” Then the bee itself could be rendered as a prototype for B. In this way, every letter is livingly brought. The same process can be followed for the numbers. Even though they will already be familiar to most first graders, this sort of formal introduction, stressing the qualities that are unique to each one, enables the numbers to become good and trusted friends. A deep investment is then made in having an ongoing relationship with these friends! Each of the numbers from 1 – 12 could be introduced via a fitting fairy tale. The story can be told on day one and retold by the children on day two, before drawing and writing the number along with images from the story and a geometric form. These forms help to express the numbers’ unique qualities while also illustrating geometric relationship. For the number 1, a fairy tale about the sun or moon (or both) expresses its unique, individual nature. Many sun/moon fairy tales from around the world can easily be found online or at the library. As shown below, a relationship can also be made between the number 1 and the uniqueness of each individual person. 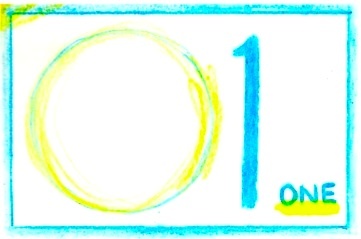 The circle could represent the sun or moon as well an important quality of the number 1. 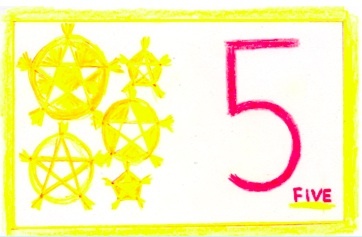 Telling the Grimm’s fairy tale, “The Star Money” for the number 5 could include the obvious relationship to the 5-pointed star. The golden nature of the human being could also be shown as one of the number 5’s qualities. Accompany this with a wonderful movement activity by using a yellow or gold rope to outline the figure of one of the children with his or her arms and legs outstretched. Tracing the figure uses “body knowledge” as an aid for learning how to draw the star. This drawing could accompany an illustration/caption from the story. After all of the numbers have been introduced, they can come together to interact, with all 4 processes taught at once through story and characterization. See our next post for more on this! And do consider Math By Hand. It’s a child-friendly program that integrates stories, movement, music, poetry and more with math. We guarantee that you and your child will fall in love with math . . . no more math tears or fears! Go to the Shop page, choose from a variety of affordable options, and buy it today!